Hello everyone, Pizza Dave here, delivering you a review of the Delta Squonk kit by Revenant and TVL. This collaboration seemed to sneak in under the radar as I have hardly seen a thing regarding it. The Delta features some innovative features, great display, a solid rda, and great overall quality and deserves some recognition in the vape market. This one has a lot to offer, so let’s dive down and see how it works, and as always, I will see you down at the bottom for my final thoughts. DISCLAIMER: This device was borrowed to me by a friend/shop manager/TVL squad member for review. This review is going to be a bit tough to nail down because it is a pre-release. It has no manual, no specs, nothing. Luckily Revenant just put this up on their site for some valuable information. Like I said above, the Delta squonk mod brings a lot to the table. This device is powered by a single 18650, 20700, or 21700 battery and has a maximum wattage of 100w. These are inserted through a hinging bottom battery door. This also reveals the squonk bottle. It can be removed, filled, and inserted back into the device, but it also has a nifty refill feature. To refill, you hold the mod upside-down, push the refill bottle (or hard tipped bottle) into the check valve style port and fill it up. It is simple, and it works. Once it is all filled up, reach for the side of the bottle and squeeze…. Wait, where is the bottle? Instead of a typical soft bottle that is physically pressed, this bottle is made of a hard plastic and is hardly exposed on the side, except for a slit to see the liquid level. To squonk, all you must do is push the button on top which says PUSH TO SQUONK. It works quite well, and the only issue I found was weak squonking when the bottle was low. Operation on this mod is very user friendly. It comes with a Vaporesso Omniboard 4.0 chipset which is on a few devices already. This board can do a lot, but it feels dumbed down on the Delta squonk. I can’t access curves, different preheats, or temp control. Maybe it will come out eventually or be accessed somehow, but I don’t see a thing about it in the menu system. All I can do is fire this thing at up to 80w with a “normal” preheat and that is all. I must assume the finished model has all those features and this is just an early release. Super Player – This mode makes this device capable of operating in a broad range of resistance (.03-5-ohms). It was a blessing and a curse to not include a manual on this first run. I had to figure it all out on my own, and it seems to be basic enough to just grab and use. I am hoping the finished version is a bit more refined as it feels very “Beta”, but we will find out! This is always the million-dollar question. To me, the answer is easy, as this thing vapes great. Even though this chipset is dumbed down on this device, it works great for what it is. The 80w feels solid all the way through the life of the battery (I used amp king 21700s and AVB 21700s). The refill method works great, and the push to squonk button is something that hasn’t been done like this before. If you are using a deeper squonking atomizer it will require a couple of extra presses or a long hold, but this squonking method just feels more refined and less old school. The squonk bottle is on the small side. At just 6.5ml it goes down at a rapid rate. Thankfully the refill system takes the hassle out of refills. This kit comes complete with the Reload RDA by TVL, so let’s hit that next. The included RDA features large flat clamps which are made for both mesh and single coils. I ran mine with the included fused Claptons and the clamp system works just fine with this build. The squonking action on this comes right up the middle of the deck and right into the coil. Liquid will run off the top and down into the wicking slots. It isn’t a super deep deck, but it can be vaped a handful of times before it needs squonking. This rda features a standard looking side air flow system. The top cap is locking for easy removal, but it has a wider channel, so it can be partially rotated to perfectly align with the coil even when the air flow is closed. It is honestly one of the best tasting single coil rdas I have used. It is easy to build on, easy to wick, squonks great, matches the mod, and the flavor is incredible. The ONLY con I can think of on this rda is they chose a name which is already taken by a well-known RDA/RTA on the market. I think you all know my answer here. I sat here and gushed over this thing for a handful of paragraphs. It is a great looking mod. It works well, and I have a feeling it will only be better with a finished Omniboard within. The refill method and push to squonk work great and offer something new to the table. I found this to be one of my favorite squonk mods to date. However, every device has a con and this does have a couple. For one, I will be a bit disappointed if they keep the Omniboard dumbed down. It would be nice to at least be able to tweak some preheats or do curves. 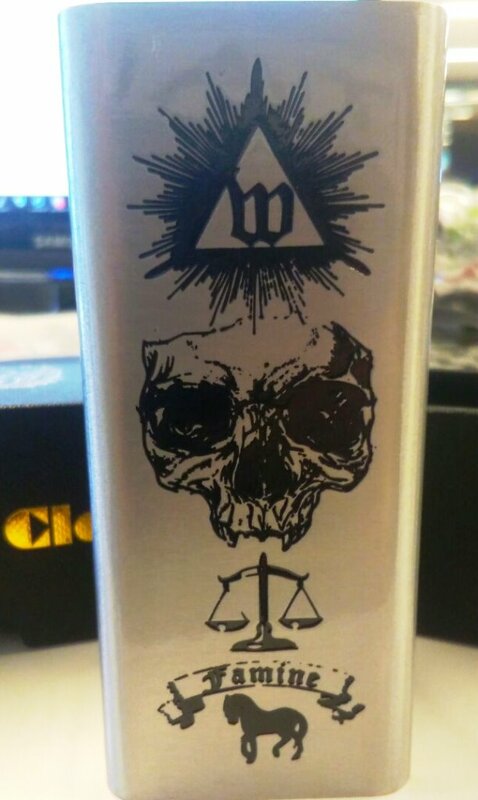 Another con is the squonk bottle is just 6.5ml and seems like a cheap component. I’m not a huge fan of LEDs, but it would have been nice to have one in the squonk bottle area to see the level a little better. Another small con is the rainbow finish and is fingerprint magnet status. It looks great when clean but shows smudges all the time! Would I recommend this device? Absolutely. I found myself wanting to use this all the time. Even with the wattage only configuration, it vapes well. The included rda is top notch for flavor and squonkability, so having something like that on a mod this solid makes it one of the best, if not the best full squonking kit ever released. I can’t think of another kit that has given me as much vaping enjoyment out of the box as this. It has innovation, a great display, simple menu system, feels solid in hand, is ergonomic……Yeah…. Yeah…. Yeah…gushing session over. Well done Revenant/TVL. Thank you all for reading this review and thank you to my friend Cody (coilsbycody_tvl on IG) for hooking me up with this for review! I must give it back, but I don’t want to. I WILL be buying one when it is released. From what I hear, this will run somewhere in that $100-140 mark, but I am not 100% sure about that one. Keep your eyes peeled and look at the Revenant Vape website for more information. REVIEW CRITERIA: I use each item for about two weeks to ensure I have collected enough data to adequately write a review. I use the same e liquid in tanks or rdas throughout all my reviews to ensure that I am comparing apples to apples between all modern equipment. I do not post reviews until I feel confident that I have used it enough to give an educated review. The reason I started doing reviews was due to poor purchasing decisions in my vaping infancy about two years ago. Back then, I purchased several different pieces of hardware without really enjoying it and I hope my reviews can guide people into spending their hard-earned money more wisely than I did! \***Keep in mind that some items I receive may be pre-release and not in retail packaging. * Quality may be less than the finished product and what is in the package may differ from the retail package as well. Hello everyone, Pizza Dave here, delivering you a review of the Delta Squonk kit by Revenant and TVL. This collaboration seemed to sneak in under the radar as I have hardly seen a thing regarding it. The Delta features some innovative features, great display, a solid rda, and great overall quality and deserves some recognition in the vape market. This one has a lot to offer, so let’s dive down and see how it works, and as always, I will see you down at the bottom for my final thoughts.​DISCLAIMER: This device was borrowed to me by a friend/shop manager/TVL squad member for review.​This review is going to be a bit tough to nail down because it is a pre-release. It has no manual, no specs, nothing. 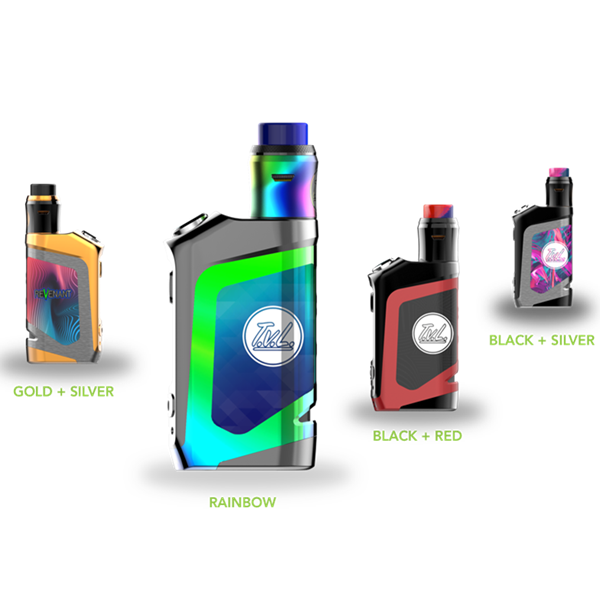 Luckily Revenant just put this up on their site for some valuable information.​______________________________________________________________________________​WHAT YOU GET1 TVL/Revenant Delta squonk mod1 TVL Delta Rda (mesh or single coil)1 20ml (I think) refill bottle1 Spare parts and tool bag3 .22-ohm fused Clapton coils​OUT OF BOX​STOCK SHOT______________________________________________________________________________​FEATURESLike I said above, the Delta squonk mod brings a lot to the table. This device is powered by a single 18650, 20700, or 21700 battery and has a maximum wattage of 100w. These are inserted through a hinging bottom battery door. This also reveals the squonk bottle. It can be removed, filled, and inserted back into the device, but it also has a nifty refill feature. To refill, you hold the mod upside-down, push the refill bottle (or hard tipped bottle) into the check valve style port and fill it up. It is simple, and it works. Once it is all filled up, reach for the side of the bottle and squeeze…. Wait, where is the bottle? Instead of a typical soft bottle that is physically pressed, this bottle is made of a hard plastic and is hardly exposed on the side, except for a slit to see the liquid level. To squonk, all you must do is push the button on top which says PUSH TO SQUONK. It works quite well, and the only issue I found was weak squonking when the bottle was low.______________________________________________________________________________​OPERATIONOperation on this mod is very user friendly. It comes with a Vaporesso Omniboard 4.0 chipset which is on a few devices already. This board can do a lot, but it feels dumbed down on the Delta squonk. I can’t access curves, different preheats, or temp control. Maybe it will come out eventually or be accessed somehow, but I don’t see a thing about it in the menu system. All I can do is fire this thing at up to 80w with a “normal” preheat and that is all. I must assume the finished model has all those features and this is just an early release.5 clicks will turn it on, and 5 clicks will turn it off. 3 clicks of the fire button locks the adjustment buttons. 3 more clicks will unlock it. It will keep firing when locked. 3 clicks of the middle button goes to the menu. The menu system reveals the following:​Default – Sets mod back to factory settingsTime Set – Set the date and timeBrightness – yeah…. brightness!Puff Counter – View and reset the puff counter and vape timeTheme – Change the color of the display (Orange, Green, Blue, Yellow, Red)Screen Timeout – Set the screen timeout from 3s to 60mAuto – Turn Auto Mode on or offSuper Player – This mode makes this device capable of operating in a broad range of resistance (.03-5-ohms).Version – Shows the firmware of the deviceIt was a blessing and a curse to not include a manual on this first run. I had to figure it all out on my own, and it seems to be basic enough to just grab and use. I am hoping the finished version is a bit more refined as it feels very “Beta”, but we will find out!______________________________________________________________________________​MISCELLANEOUS PHOTOS​DELTA KIT ALBUM​______________________________________________________________________________​HOW IT VAPESThis is always the million-dollar question. To me, the answer is easy, as this thing vapes great. Even though this chipset is dumbed down on this device, it works great for what it is. The 80w feels solid all the way through the life of the battery (I used amp king 21700s and AVB 21700s). The refill method works great, and the push to squonk button is something that hasn’t been done like this before. If you are using a deeper squonking atomizer it will require a couple of extra presses or a long hold, but this squonking method just feels more refined and less old school. The squonk bottle is on the small side. At just 6.5ml it goes down at a rapid rate. 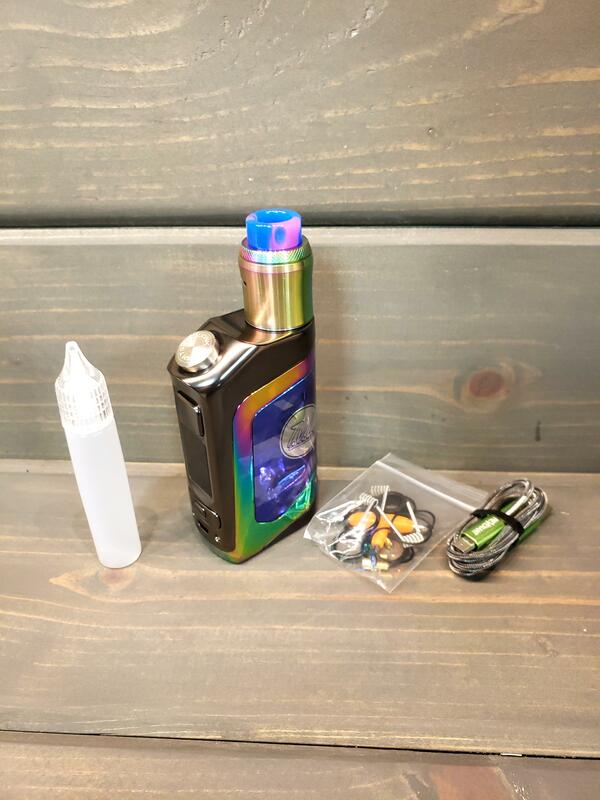 Thankfully the refill system takes the hassle out of refills.​This kit comes complete with the Reload RDA by TVL, so let’s hit that next.​The included RDA features large flat clamps which are made for both mesh and single coils. I ran mine with the included fused Claptons and the clamp system works just fine with this build. The squonking action on this comes right up the middle of the deck and right into the coil. Liquid will run off the top and down into the wicking slots. It isn’t a super deep deck, but it can be vaped a handful of times before it needs squonking. This rda features a standard looking side air flow system. The top cap is locking for easy removal, but it has a wider channel, so it can be partially rotated to perfectly align with the coil even when the air flow is closed. It is honestly one of the best tasting single coil rdas I have used. It is easy to build on, easy to wick, squonks great, matches the mod, and the flavor is incredible. The ONLY con I can think of on this rda is they chose a name which is already taken by a well-known RDA/RTA on the market.______________________________________________________________________________​FINAL THOUGHTSI think you all know my answer here. I sat here and gushed over this thing for a handful of paragraphs. It is a great looking mod. It works well, and I have a feeling it will only be better with a finished Omniboard within. The refill method and push to squonk work great and offer something new to the table. I found this to be one of my favorite squonk mods to date. However, every device has a con and this does have a couple. For one, I will be a bit disappointed if they keep the Omniboard dumbed down. It would be nice to at least be able to tweak some preheats or do curves. Another con is the squonk bottle is just 6.5ml and seems like a cheap component. I’m not a huge fan of LEDs, but it would have been nice to have one in the squonk bottle area to see the level a little better. Another small con is the rainbow finish and is fingerprint magnet status. It looks great when clean but shows smudges all the time!​Would I recommend this device? Absolutely. I found myself wanting to use this all the time. Even with the wattage only configuration, it vapes well. The included rda is top notch for flavor and squonkability, so having something like that on a mod this solid makes it one of the best, if not the best full squonking kit ever released. I can’t think of another kit that has given me as much vaping enjoyment out of the box as this. It has innovation, a great display, simple menu system, feels solid in hand, is ergonomic……Yeah…. Yeah…. Yeah…gushing session over. Well done Revenant/TVL.​THE OVEN TESTIf this device went into the oven, would I go out and get another one? YES​______________________________________________________________________________​PROSErgonomicInnovative push to squonk methodInnovative refill methodBeautiful displaySolid build qualityGreat rda included18650, 20700, and 21700 compatibility______________________________________________________________________________CONSSquonk bottle is a measly 6.5mlOmniboard 4.0 is dumbed way down (HOPEFULLY this is changed down the road)Finish is a fingerprint magnetSquonk bottle feels cheap​Thank you all for reading this review and thank you to my friend Cody (coilsbycody_tvl on IG) for hooking me up with this for review! I must give it back, but I don’t want to. I WILL be buying one when it is released. From what I hear, this will run somewhere in that $100-140 mark, but I am not 100% sure about that one. Keep your eyes peeled and look at the Revenant Vape website for more information.​____________________________________________________________________________________________________________________________________________________________​Pizza Dave – Delivering real reviews, with no extra toppings​­­­­­­­­­­­­­­­­­­____________________________________________________________________________________________________________________________________________________________​REVIEW CRITERIA: I use each item for about two weeks to ensure I have collected enough data to adequately write a review. I use the same e liquid in tanks or rdas throughout all my reviews to ensure that I am comparing apples to apples between all modern equipment. I do not post reviews until I feel confident that I have used it enough to give an educated review. The reason I started doing reviews was due to poor purchasing decisions in my vaping infancy about two years ago. Back then, I purchased several different pieces of hardware without really enjoying it and I hope my reviews can guide people into spending their hard-earned money more wisely than I did! \***Keep in mind that some items I receive may be pre-release and not in retail packaging. * Quality may be less than the finished product and what is in the package may differ from the retail package as well.